The recent upgrades to google search start to really demonstrate the difference between their search capabilities and the competitors. 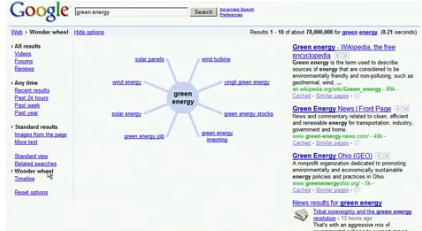 Google Wonder Wheel search options let you see the topics related to the one you are searching and then navigate this multi dimensional network visually. These visual representation tools have been around for ages, but this is the first time they have been combined with the vast depth of Google’s capabilities in a combinatorial manner. The wonderful thing is the ability to also search by other dimensions such as timeline and drill down and more. The lessons for user interface designers are also important. 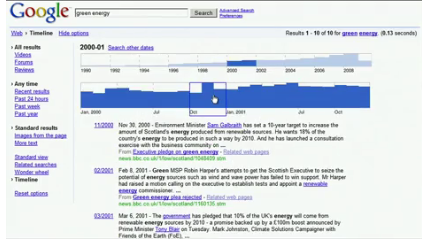 They are reusing the existing search bar to keep context and using the left navigator for options. The world will be trained this way now so bad luck to anyone who doesn’t take this approach, your uses will need to be retrained or find your app counter-intuitive.